Updated Monday April 8, 2019 by Ryan Feeney. 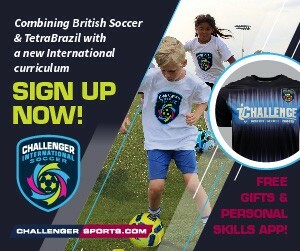 Challenger Sports is bringing summer soccer back to our community with a brand new approach to player development. Challenger's International Soccer camp is a new program that combines the best practices from around the world with an interactive digital coaching component that will accelerate the player's learning experience both on the field and at home. The 5 day camp caters to players of all ages and abilities. We are excited to host Challengers professional international staff to deliver this exciting, fun and challenging program. Click the link for more information and to register today!